De Italiaanse kustwacht onderschept een bootje met illegale immigranten en brengt ze aan land op het eiland Lampedusa. 2. De haven van Brindisi, ook in het zuiden van Italië, waar Albanese vluchtelingen gedeporteerd worden terug naar huis. De Maroccanen, Tunesiërs en Algerijnen die op het kleine (600 inwoners) eiland Lampedusa sailed from the coast of Tunesia, often in rickety vessels. 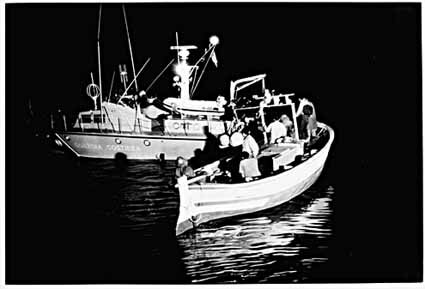 They arrive exhausted, seasick, unconscious sometimes - and knowing they will be arrested by the Italian coast guard. After a short medical check the coast guard hand these illegal immigrants over to the carabinieri. This Italian state police put them immediately on a ferry to Sicily. Then, without exception, they all are told to leave the country. But according to Italian law orders they get two weeks time for an appeal. In those two weeks they are allowed to go free. They use this period to go underground, or to travel further on, to France and Germany. These two countries have protested in the European parlement against this leaking gap in the new European outside borders. The other pictures show the situation in the harbour of Brindisi. During the exodus from Albania early 1997 tens of thousands of Albanians fled to Italy and spread all over the country. Nowadays the Italian police hunts these Albanians down and put them on transport to Brindisi. Here they are put aboard special ferries that bring them back to their country. Click here, or on the picture above, to start the photo series (consisting of 10 pictures - keep on clicking on them to see the next ones).